Grand Design also known as Grande is a 1999 Appaloosa Friesian Sport Horse stallion. He was laser measured at 16 hands tall at six years old during his inspection. His sire, Friesian stallion Nanne, is said to be 17 hands tall. His dam is Designer Princess, also dun factor buckskin with a blanket and large spots. She is approximately 15.2 hands tall and has a strong build and a beautiful dishy face. She consistently produces top quality foals and sure passed on her color and quality to this son. Region 6 Grand Champion crossbred horse for 2004. I have been totally impressed with this horse!! His coat is like Teflon and is certainly much more dirt resistant than my other appaloosas. He is friendly and easy going. He loves to go trail riding. We have taken him on trail rides with mules and mares, he behaves like a gentleman. People have been shocked to find out they have been riding next to stallion. Even the black bear he came face to face with while trail riding one day, didn't bother him. I have never seen him go light on his feet in any terrain with out shoes. His endurance is incredible he never seems to wear out. I was not a Friesian fan hooked on hair. I was just looking for a horse with good size, feet, bone, endurance and some brains. Something I can ride for 8 hours and not want to scream after the first two. 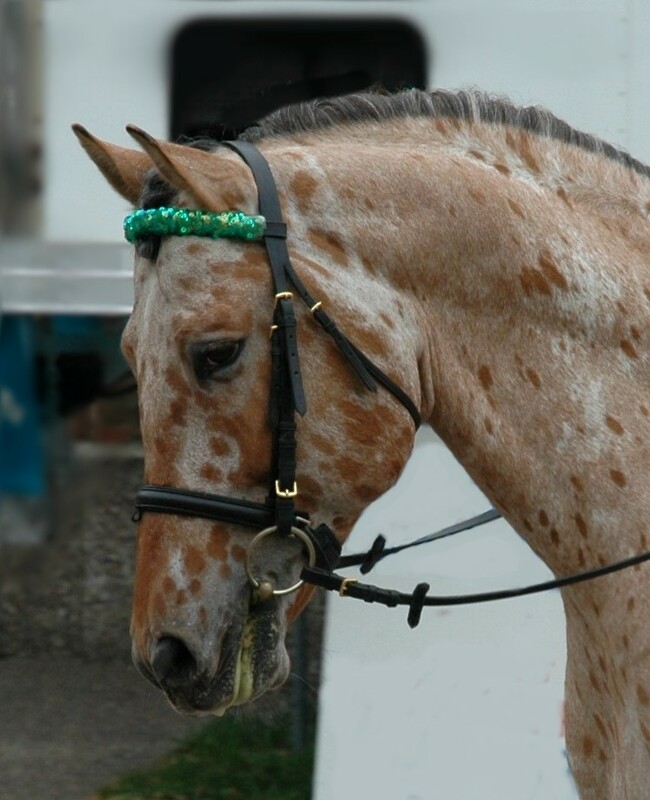 I think I found it with this horse having all the outstanding combined qualities of the Appaloosa and the Friesian. Base breeding price for 2013 is $600. We will be shipping this year. Homozygous Black, carries one copy of Dun and one copy of Agouti . He probably carries some other unidentified color modifier that dilutes black to a tan color.